The heat is on in this episode. The walls are caving in and the water level is rising. Nothing goes well for our duo who are just trying to do the right thing. But it all works out in the end in a lovely and inspiring way that makes me love this drama even more. COR and BR are at a standoff in the office. She tells him to step aside. But he holds his arm out to block her. She asks him if he is going to block her now. He says that she is right, she is wrong. Judges are the most powerful when they follow the law. The head of the judges needs to summon a meeting of the judges if 1/5 the of the judges agree. if you want to raise the issue then we need to do it properly, I will send the group mail. Cut to BW in his office reading the mail. He thinks his friend made a huge amount of trouble right now, he never thinks about others, why is he doing it? It makes the issue bigger if someone like BR does it. His colleague asks him if it is about COR, she was getting signatures right? All the chiefs say that GC is misunderstood and it is because Judge Hong is a weak person. But BR doesn’t move without any evidence, this is a strange issue. BW goes to BR and asks him how he can work after throwing this lunch bomb into their quiet court. he says he just suggested that they should talk about sexual discrimination and, as he wrote in the mail, he wants to discuss the culture of discrimination. BW sighs and says that of course, everyone knows what he is talking about. How many people is 1/5 of 325 divided by 5? How many is that? BW tries calculating it then mutters that they used calculators in engineering school. COR says over 70 people signed the petition so the lunch box bomb did not fail. But, BR says signing the paperwork and showing up for the meeting is a very different matter. if enough people don’t show up then they can’t have the meeting at all. BR asks if mostly females signed? COR says a lot of males signed because of BR. But no chiefs signed. They have a long way to go. COR tells them that she will take this chance to learn all the judges and see how they all work together. BW feels that COR’s fighting spirit is up so he will leave. She holds his arm and asks for help. He asks her if he can refuse it then he tells her that he needs some more sugar, he will think about it. He leaves and is sure to tell DY goodbye on his way out. DY tells him 22,200 won is the price of the snack food he took. He picks the most expensive things. MW asks what he took. DY tells him he shouldn’t do anything that will stretch his pants. DW jokes that she notices things well, is she alpha go? He sets all the candy on her desk. She tells him it is now 20,500 won. BW leaves and mutters that she is a scary woman. Pretty but unlikable. She says that she has a good figure as well and she has a good set of ears. BS tries to apologize but she already walked into the judges’ office to let BR know that SS is looking for him. BR goes to meet SS in his office. SS smiles and tells him that the head of the union came. All the chiefs are scared just in case all the associate judges strike. BR tells him that he didn’t know that their relationship was employee and employer. SS mutters that after COR he doesn’t take him as his chief, okay use banmal we are equal, equal. BR tells him it isn’t like that. SS says he understands because COR is so close to Judge Hong, but I did not know that you would do this as a right side associate judge. He knows that GC has problems, but if it gets bigger then you will get hurt more. in this organization, you will have to see the same person forever. I will talk to GC, but you guys need to keep quiet. BR apologizes and says it is too late to turn it back. SS yells and says it is not too late, those obsessive people bite when they are in a corner. You don’t avoid poop because it is dirty, not scary. but sometimes it is better to step in the poop. he is telling him this much but you still ignore me, go out and do whatever! BR leaves as SS mutters that in this world there is such as thing as scary poop. Cut to GC apologizing to HJ about the situation. HJ tells him that he knows he works hard but working hard is not enough, he has to do it well. There are a lot of people who just work hard. GC yells that he will work hard. HJ says, If you tell me quietly then I can hear it well. There are some reporters that are already asking the public relations team about this, he worries about this. The court should be righteous and it should look righteous. HJ brings up chief Cho Young-jin and says he can take care of this matter well. GC tells HJ that he need not worry about it, he will take care of it! HJ tells him to drink more tea. GC nods like his head will pop off and starts drinking the tea. Afterward, GC walks the hall with his right side judge. he looks like they are going to the hospital together to meet Eunnie Judge. But they came empty-handed so the right-hand judge goes to grab flowers. The boss lets the nurse know that he would like to see his left-hand judge. the husband goes out, he does not want him to go into the room. But he barges in and basically complains that she didn’t tell him that her condition was bad. Eunnie gets on her knees and tells her that he told her that she shouldn’t affect work with her personal affairs so she didn’t tell him. He said women are problematic because they care about family more than work. You always say that so I couldn’t tell you that. I am sorry. For you, my condition is just bad. She starts crying and holding her belly. The husband tells him to leave, how can he come here and say that. The judge kneels and tells him that he wants them to know his true heart and accept his apology. But the husband tells him that he does not listen to others, just leave. the right-hand judge tells the chief to stand up and leave. The same guys go to the bathroom and talk about how the chief went to apologize to her and they told him to kneel in front of him. Ah, these women are the worst. This famous Miss Hammurabi is a freedom fighter, why is she cosplaying like this. She is everywhere. She just wants attention, it is contagious, BR is even affected now. SS gets out of the bathroom. The two men get all nervous. SS asks them if this is the first time they have seen each other pooping? One of the guys accidentally pees on the other one. Cut to the mood in the judge building. BW overhears that the mood is bad and rumors are spreading about the judge going to apologize. They just torture one person, that is what they do. Everyone said if she was pregnant then she should have said it. But COR stands and said it is not about knowing or not knowing, it is all about making the associate judges work hard for his career. If she isn’t pregnant then it is okay? BR says he is framing it differently. First, she worked so hard and had a miscarriage, not it changed to her making him kneel in front of her. BW thinks, with this mood, no one will go to their meeting. Their meeting is on Friday at 4 pm, it is the busiest time of the week. COR tells them that now they are increasing her drive, let’s all fight. BW mutters that he forgot how crazy she is. COR tells them that they should attack at lunchtime. COR goes to yoga class and spreads the word around to all the women there while she stretches. Then she goes to a flower shop class and spreads the word around there to all the female judges. Br goes to all these events and they actually tell him that he is great at making a flower bouquet. At work, DW even comments on how pretty the flowers are to the embarrassment of BR. BR sits at his desk. COR mentions to him that everyone listened but that does not mean that they will go to the meeting. BR thinks COR went a little too far with her wording about changing their rights and all that. Everyone thinks it is burdensome to raise an issue about their superior. COR asks him what they should do, he is the one that told her that they should get the meeting going and all that. BR says they need to get the majority on their side They need to get them to mutually agree. Okay? COR tells him that his mother-in-law like nitpicking is helpful sometimes. BR is all like, umm, I am not a nitpicking person. But COR just keeps talking and says that BW said he would do this with us but he isn’t around. BR says they can keep doing it together. Four people are in a crowded office when BR and COR come in. 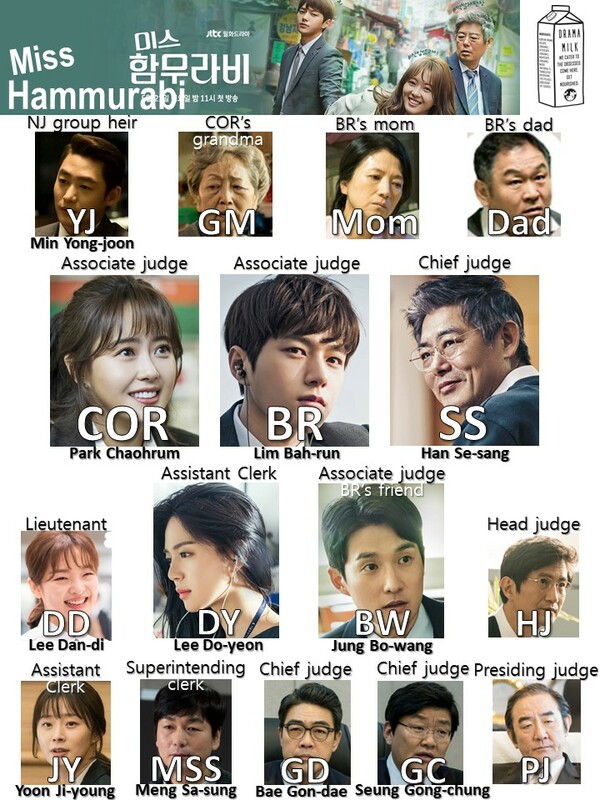 It looks like these are the people that work under the judges, they are the clerks but one of them might be a judge. One of the men asks for what COR has. He takes it and then understands what this is. He is hesitant. BR tells him to please read it and he is sorry that they are bothering his dinner. They go to the next judge. This judge says that he read the email but he isn’t sure if there should be a consideration for female judges. Their court has the best childcare environment. COR says it is difficult to use it. But this judge is confrontational and asks if they need to sing congratulations to them? But then he apologizes and says that they already have two people on maternity leave. They are washed in cases, he wants to see his daughter but he only sees her sleeping. BR mentions that male judges can go on paternity leave but this judge says he has a single income household, if he takes a vacation then they won’t survive. He is sorry but he is already having a hard time and can’t say things nicely. COR apologizes for asking him when he is so busy. BR and COR leave the building but they turn back and see all the lights on. All the people are high up there working. It is difficult to put the young judge idea together because of all the different reasons. It is like Anna Karenina’s first sentence “All happy families are similar, all unhappy families have different reasons for being unhappy.” They think that must be why the world does not change. People with difficulties have a hard time holding their hands with each other. BR thinks everyone might have the same reason, but they don’t know it. BR gets a phone call about something. He hangs up and then talks to judge Park. The grandmother case is finally opened for retrial. It is room #43, BW will be over that case. COR is so happy and wants to go see it, however, BR is against that idea. He thinks she should not sit in on it, she can listen to it but should not be there. However, he does not elaborate on it further. GD tells the Umma that her evaluation of the hospital chart is returned because it is too much work, they don’t have time to do it. The woman’s lawyer says that 3 big hospitals said that they cannot do it, he believes the larger hospital is using their influence on this case. The other women lawyer says this is not true. They also do not have evidence in this case. GD tells them that he will give them one more chance to find the evidence. Court is adjourned. Halmoni is so crestfallen. This is a long journey for her. Afterward, BR wants to know how they prove medical malpractice? They can evaluate what is wrong or right after evaluating the chart. The hospital on the case is one of the best and say that they are too busy to evaluate it. maybe they all have connections. COR says that a tiny hospital accepted the evaluation but they did not accept their decision yet. They are not sure if the tiny hospital will look over the chart. BR wonders if this is like hitting a rock with eggs. COR tells him that is her specialty, hitting rocks with eggs. But she will do it her way. BR thinks back to when she said this and smiles. Then he approaches her and tells her that two will be better than one even though they are eggs. One of the men is a halbae that wears traditional clothing. Another is a man who loves smelling flowers, he is a chief with a lot of emotions, he is a good person, let’s say hi. BW tells them that they have a lot of strange people, you don’t have to look around (but he might have been talking about her). Then they see a female judge who is the élite of the élite, she is number one since she was little but don’t give her the flyer, she might hurt you more than help you. COR gives it to her anyway. The woman accepts it coldly. Then GD comes in, BW’s chief. GD says he thought they were busy but they can do this work? BW tries to explain things but the damage is done. Cut to COR reading a news article about a judge forming a Union. Then they show COR in her mini skirt gif. The article talks about young radical judges leading the movement. BW asks them if he is apart of it? Say it ain’t so! I never caused problems. COR keeps reading the article. it says that the most famous person is Miss Hammurabi, she is famous for her mini skirts and unbreathable backside (her back is so pretty that he can’t breath). COR says this reporter can’t breath all the time, he isn’t dead yet? BW reads another article that also talks about COR and how she might be in other cases. It explains the halmoni case about how COR connected her to a lawyer. BR tells her that the head judge also talked about his case. He said this case might be illegal as a judge and could be a disciplinary action. COR mentions that this is the reason that he wanted to stop her? BW thinks they should make an issue with things that make sense, but BR just mutters that they will make an issue with whatever they want. COR tells them that she will be responsible for her behavior with her good intentions and she is also going to back GC’s pay for his bad intentions. BW has had enough and says that he wanted to help out a lot, but it is difficult to help when the matter is this serious, it is like a war. COR asks who has a war? BW mentions that after she took the petition paper around, all the chiefs became angry, how can she do that much? BR asks his friend if he wants to be a pacifist that is loved by everyone? BW takes it harshly and says that he shouldn’t be so harsh, he does not want to be anyone’s enemy, especially BR’s. BW leaves and runs into DY at the door. Instead of talking to her, he just walks on by. DY lets BR know that the head judge is looking for COR. COR waits for the head judge to finish his work. Then they talk. He asks her about the newspaper article. She says she read it and it was not true. How can she be involved in another courtrooms business? She just listened to a halmoni that needed help and gave her advice. HJ asks her if she read the 5th section line 2 of their judge guidelines. She says that she did and she wants to ask him a question. Their law people celebration day he did free consultations with citizens and presiding judges. What I did, how is there a difference? Can you teach me? HJ tells her that she is an interesting person. She brought the petition against GC without any evidence, that is a group movement, right? COR says she has evidence, she heard everything from her. HJ tells her that she only heard one side which makes people angry. He is blocking it because she is a first timer. COR says she won’t just point out one person and make him bad. HJ tells her that they are not negotiating now. Then he calls his assistant and tells them that COR is leaving. He also apologizes for not serving her tea, but it is a busy day for him. BR meets with his old judge boss and tells him that COR is in a lot of trouble. The superiors want to give her disciplinary action. Can you block her from getting this disciplinary action? You have a lot of friends here. The judge says he can think about it, but he thinks they should quiet down a little bit. Everyone knows that they work hard, but they have to look at the big picture in society. Everyone complains about the court. The citizens want to have a big change and the issue they are raising is small. It is an internal problem. Right now, they need a bigger change. BR is stuck on the word small. He asks him if it is small that people who work together with stress and discouragement every day, they work right next to you, is that small? You say that is small, but all the small things are put together and become the big thing that you talk about. Please excuse me. BR stares at his old judge boss for a moment, then leaves. He tries to collect himself in the hallway. Later, he goes back to his office and tells COR that they should step back a little bit. COR tells him that she is not being greedy. People don’t care when people in power destroy the weak. But when the weak raise their voice and say things are too aggressive and burdensome, then it is a problem. BR and COR talk back and forth about it, BR has a suggestion that will systemically solve this problem. Gender equality training. Multi-directional evaluations. he gives it to COR. But COR thinks changing the system and having a constructive discussion is good but what about Eunnie who has irreversible pain? BR wants to know if she wants revenge for her? COR says no, she wants justice, that is their job right. But BR thinks her justice is a form of revenge. Cut to their clerks taking a coffee break that MSS is buying for everyone. DY will stay though because she thinks their chief will have a panic disorder if she is not there. Cue the Chief calling from his office about where he put a memo. She tells him it is in front of him my his meal eating hand. All the team members understand right away and smile and wave as they leave. Everyone else goes outside to drink coffee. MSS tells COR that he saw the article but she did nothing wrong. they should give her a reward, not disciplinary action. JY thinks if she should have a disciplinary action about this then what about Hong for making another judge have a miscarriage. She heard from another clerk that judge Hong wanted to get a document about a lay off. That clerk asked judge Hong (eunnie) to take care of herself first, but Judge Hong said every moment is important for them so he can’t just sit around and delay the judgment. This is the woman that is in the hospital after having a miscarriage. COR is even more upset and says this is not the time for her to worry about others. BR thinks in his mind that COR should care about herself also. They go back to their office and have moments of awkward glances at each other. COR tells BR that the coffee was sweet, right? He says it was bitter. But she says it was super sweet, she is energetic now, she thinks the support from their coworkers is really sweet. BR tells her that he is sorry that he couldn’t’ be a sweet support to her. But she just says that is not true, his help is the biggest. COR gets a call from Oppa at that moment. She goes to a lounge with him. YJ Oppa talks about how he heard about her article about helping the halmae, it is not publicly known, but they bought that hospital. After reading the article, he asked them to reinvestigate it. He does not think that COR should be responsible when she did nothing wrong. The hospital wants to sue the halmoni for blocking their business and their honor. COR asks if he went all the way there to tell her that? The big heir to NJ Group? You take care of all those tiny suits now? YJ says it is because she is involved. He told his lawyers that it is an unfortunate event so they should at least give her some money and clean it up well. But COR says they will go to court and see who is wrong, that is court. She says she is busy so she will leave. The court for Halmaes case continues. Halmae says her son had leg pain and went to the hospital, but he died in the surgery room. if he was not killed by the doctor then what is it! The judge just tells her to lower her voice, please. They talk about how the victim had fibrosis due to a previous treatment. The big hospital has no time to look at the case and the small hospital gave them a two-page report. GD asks if there was anything wrong with the medical report. The lawyer says the hospital wrote it. GD says if you suspect the basic system then it is impossible to do anything in the court. Halmoni speaks up and says there were two doctors. The first doctor had a red face. But the lawyer says the doctor did not change. This case is basically a mess because the hospital is hiding evidence and no one can get it from them. The judge says they will close the case if there is no other evidence. The halmoni wails about how he can’t close the case like this! Later on, COR and BR talk about the case. COR’s friend told her that they purchased the hospital and want to settle for 20k, but Halmoni’s “Han” will be too big if things are finished in this way. (Han is like that feeling deep inside of sorrow and regret and all the sad things all rolled into one word). COR goes to visit Eunnie with BR. Eunnie tells them that they are too busy to visit her but BR says he should have visited her earlier. COR lets them know that everyone wants her to recover. But Eunnie thinks everyone is talking about her as the miscarriage woman. She knows that they will have good intentions, but have they thought about it, everyone that she doesn’t even know if talking about her. She is scared of seeing them all again. They will all talk about it and talk about her baby. BR scans Eunnies desk and sees that she has a lot of notes. She is still working. Eunnie says that a lot of people came by and called her to tell her that she is too harsh to GC, he is not a bad guy. She does not want to see them anymore. COR was even in the newspaper. Eunnie is actually in the hospital that they are fighting against with the halmoni case. COR and BR leave. COR looks so sad for her eunnie. BR tells her that it isn’t her fault, she did nothing wrong. But COR thinks she gave her eunnie an even harder time. BR tells her that she didn’t do it only for her, she did her own fight. COR says it might have been her own greed and heroism. But BR tells her that it is okay to be greedy and sometimes it is good to be a hero. The motives are important. No one cares about it but you are the one that tries hard as if it is your own thing. Whatever hero or what, you dragged a quiet person like me into it, so don’t give up. Stand up and do this until the end, like you always do. hey, stand up, you didn’t do anything wrong. But COR has the hardest time standing up. She says he blood is cut so she can’t stand up. Maybe she sat for too long. BR mutters eh….ingana (come on). he thought he said that in his mind, but he said it out loud. She asks him what he said and he is all like, you heard that? He hurries to help her stand up. 1-2-3. COR talks to halmoni for a moment. BR brings it up and asks her what she told the halmoni to do. COR says she told Halmoni to accept the money, she did one-person protest too long, she doesn’t even have a place to stay. She was supposed to get 20k from the hospital, but she received 50k. This was because NJ Group bought the hospital and YJ is the executive director. COR wants to be angry, but when she heard that she got 50k, she was actually thankful. This money can help provide a warm room and meals for her. BR tells her that she did her best, halmoni will be thankful. COR asks him if he is telling her that she didn’t do anything wrong. He mutters that she doesn’t’ do wrong things all the time…sometimes….la la. Later on, COR meets with SS to apologize. She is really sorry and wants him to listen to her just once. they sit. What COR wants is for SS to persuade other chiefs. COR thinks her fight isn’t against chiefs. SS wants to ask her a question, before she made an issue like this, did she talk to him (GC)? She needs to listen to both sides, that is her job as a judge. She never talked to him and she never talked to SS either. It isn’t about being right or wrong. The chief is human too, they aren’t monsters or aliens, you know that right? COR goes to her halmoni and talks to her to gain strength. She explains how people who fold their arms inside should not be a judge. Halmoni tells her that she forgot the meaning of what she gave her. They need to go to the temple. They both go to the temple. Halmoni tells her that it does not matter if your arms fold in. You should have many, many arms. Then you can embrace all those people who have a hard time. They really have the meeting of the judges. But it does not look like they have enough judges present. There are a lot of associate judges, but no chief judges. BW isn’t there as well. BW is in their office and asks for BR. DY tells him that BR went to the meeting room a long time ago. BW mutter that he knows that. DY says that this is not good, men with good butts don’t matter if they hesitate. BW is all like, huh? DY tells him that he has good ears, he should go, it is just now 4. DW smiles and thanks her and tells her that he does a lot of squats. He runs off. The head judge calls the meeting to order but says there are not enough people. But then SS comes in and tells them that it is difficult to come here on time. Old people are slow. he looks around and says no one will call him chief. then he turns around and smiles at COR who is trying to hold back her tears of joy. Then some of the other judges come in. These are all the blemished awkward judges. it looks like SS called them all to be there. They joke that the most blemished judge called them so they had to show up. Then the woman superstar judge that no one likes comes in. BW also comes in and sits way in the back. The head judge is about to speak, But then all the door burst open and a lot of judges show up. One of them talks to COR and says he is sorry that they are late. he had a meeting with a supreme court judge. The judge says he SC judge is important, but their coworkers are more important so he politely told that judge bye-bye. But they still need 20 people to make a majority. HJ tells the presiding judge that they can quit here because they don’t have enough people. But COR stands up and approaches the front. She just wants time to speak to everyone a little bit. HJ wants to know what she will say, he is sorry but PJ is the one controlling the meeting. PJ – Tell me if you have a good idea….she said she had a good idea. COR is able to speak to everyone. She thanks them all for coming and says that first of all, she has something to confess, she likes her chief. She likes his turtleneck that he has from looking at cases all his adult life. She likes his chubby stomach from not working out. She keeps saying what she likes about him. Sometimes she hates him when he is angry but he also timidly regrets those moments so she likes him more. But most of all, he has judged for more than 20 years and still takes cases personally. This gives her a problem as his associate because he wants to check the case a lot. She wants all the associate judges to like their chiefs. She hates their structure that makes all these good chiefs have a hard time taking care of all their cases. She hopes they work hard and reward each other by helping people, not about promotions or solving cases. But that they look at their people and coworkers, she wants to have room to understand coworkers. They don’t have enough people so they can’t start their discussions. A lot of people come here when they don’t have time. I have a female judge that I respect a lot that was always on the side of people who need help. When she retired she quoted a solo Himalayan mountain climber “He only could move forward the amount he could win in the fight against himself. When you can’t win anymore, he came back crying.” You can come down smiling because all of us made the difficult first step. (So she is basically saying that they all made the difficult step of coming to the meeting so they should all be very proud of that achievement). Everyone starts clapping. DW sits behind BR and tells him that she will vote for COR in the presidential election. BR calls him crazy. PJ mutters that he heard a good idea, so they can finish there. He smiles. Afterward, GC bows to all the judges for suffering a lot, but everyone is happy as they leave. he does not understand what is going on. Later on, GC drinks with the reporters. We find out some information about him, like he sent his family abroad to study which is why he tortures his associates so much. You went too far. GC tells them that it is okay, nothing happened. Young people make up things and they made this issue. I will never forget about this. The reporter drunkenly tells him to stop working so hard. He is not royal blood among judges. But GC says he is #1, he was always #1 among judging cases, he won over everyone. He worked hard….really hard….really…. He hangs his head drunk. A wonderful ending for this internal conflict. Nothing was resolved, but it shows that a lot of people want to have a discussion to resolve this. They are ready to take on this issue in order to make their workplace a safer environment for everyone. I have a little feeling that this issue might continue in some form in future episodes. I really love how the judge who never speaks and just asks for good ideas turned an awkwardly funny earlier moment into a very serious and touching moment at the end of the episode. I’m a little bummed with how Halmae’s case went, but at least she was able to get a settlement for more money than the hospital wanted to pay her. Also, I love this writer. BR – I want to know about you. Next Post Premiered: Are You Human, Too? Guys.. Do you know who is cameo in Episode 6 (acting as Congressman.. with case “delete photo”)? We haven’t watched episode 6 yet, but we will look for that when we watch it today! Your recap help me understand the meaning of this drama.. I just disappointed with the ending.. because of I don’t know the resolve of the case..